An assortment of adventurous outdoor activities, a rich culture, fantastic food, and an all-around laid back attitude, makes Chiang Mai one of the most attractive cities to visit in Thailand. The Chiang Mai International Airport is small, low-key and very manageable. International flights are mostly to surrounding countries like Myanmar, Laos, Malaysia, China, and Singapore. Flying in and out of Chiang Mai is very convenient if you don't have a lot of time, and need to get from the North to the South of Thailand (or vice versa) in a hurry. A few months back I needed to get from Chiang Mai to Phuket with a friend who only had a few days to spare. I was able to purchase a flight with Air Asia about 1 month prior at a cost of 1400 THB ($46.74). The flight took 2 hours, the bus would have taken 2 days. Chiang Mai Arcade Bus Station is the main hub that handles long bus hauls from city to city around Thailand. If you take a bus from Bangkok to Chiang Mai, you'll get dropped at this station. You can easily jump in the back of a covered pick-up truck and pay around 20 THB ($0.67) to get to the city center. Alternatively, you can take a tuk tuk for around 50 – 80 THB ($1.67 – $2.67). Chang Pheuak Bus Terminal is the station that is used for short bus trips, mostly to destinations that are in the same province as Chiang Mai. If you have the time, one of the most popular ways to travel in and out of Chiang Mai is by train. The route from Bangkok offers a few different options, ranging from 2nd class seats to VIP sleeper beds. Chiang Mai Train Station is located just a few kilometers outside of the the city, and is easily accessible by tuk tuk and songthaew. Chiang Mai is a great place to just get out and walk around. The city center is small, and the traffic is much more friendly than Bangkok. The air is fresher too. Unlike the roaring public buses of Bangkok, Chiang Mai mostly uses small covered pick-up trucks called songthaew's for public transportation. If you don't know the routes, just ask the drivers as they are normally helpful, and can direct you to the correct truck. Journeys cost 15 – 60 THB ($0.50 – $2) per ride depending on your destination. Small, 3-wheeled tuk tuk's are also a common form of transportation in Chiang Mai. Make sure you agree on a fare prior to taking one. Journeys should cost 30 – 100 THB ($1 – $3.34) depending on your destination. Chiang Mai is a good place to rent a motorbike/scooter for getting around town, and the surrounding countryside. You'll probably have to put a deposit down, and maybe even leave behind your passport, but the rate should be around 150 – 250 THB ($5 – $8.36) per day. Make sure you are supplied with a suitable helmet. Chiang Mai has loads of accommodation options, and prices on the whole are cheaper than in Bangkok. It's more common to get a twin or double room as opposed to a shared dorm bed. T-Room Guesthouse – 23 Soi 3 Ratchamankha Road, T. Phrasingh, A. Muang, Chiang Mai, Thailand 50200. Located in the center of Chiang Mai on a quiet little street. Double rooms are around $12 per night for two. Parami Guesthouse – 210212 Charoenrat Rd., Chiang Mai, Thailand. A small little friendly guesthouse in an old wooden building. Double rooms cost around $10 for two. Good Will Guesthouse – 8/2 Chiang Mai, Lamphun Rd, Soi 2 Chiang Mai, Thailand 50000. Cheap little guesthouse with clean rooms. Doubles cost around $6 – $8 for two. If you are interested in spending a little more time in Chiang Mai, there are plenty of places to rent short term or long term. Check out the classified ads on Thai Visa for the latest information. 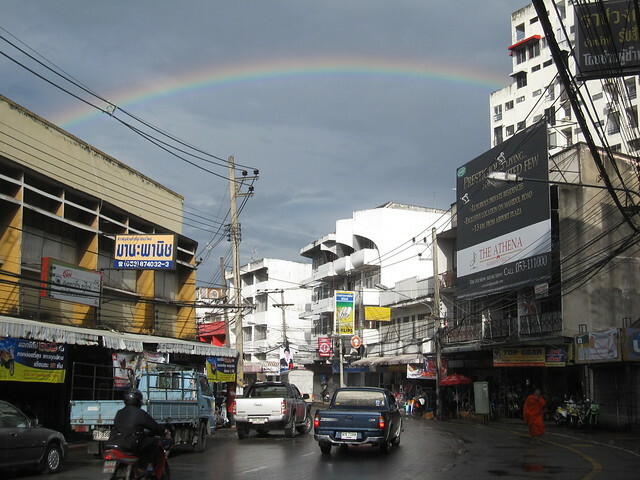 I would also recommend just walking around Chiang Mai and checking out suitable apartments. There is a large Couchsurfing community in Chiang Mai, so be sure to make some contacts prior to arriving (if you are interested). 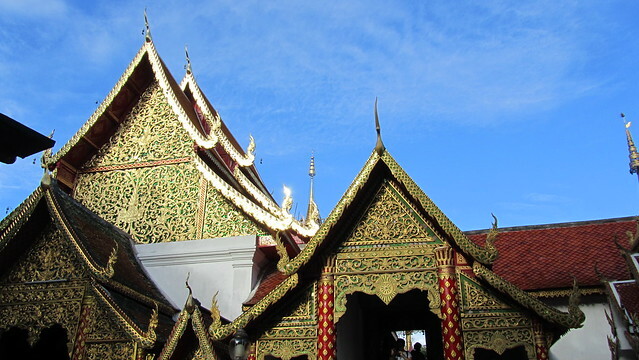 Temples / History – Chiang Mai is famous for a few impressive Buddhist temples and royal palaces. Wat Chedi Luang is a beautiful ruinous temple that dates back to the 14th century. A more modern temple with an ornate interior and intricate painted murals is Wat Phra Singh. Museums – The Chiang Mai City Arts & Cultural Center is a museum that depicts the history of the area around Chiang Mai through a multimedia artful approach. Open Tuesday – Sunday, 8:30 – 17:00. Learn to Cook Thai Food – For its size, Chiang Mai has an extremely high concentration of cooking schools that will give you a tasty lesson on how to cook awesome Thai dishes. Check out Baan Thai, Siam Rice, or the unique Thai Farm Cooking School. Markets and Shopping – The biggest daily fruit and vegetable market, called Warorot Market, is located in the middle of town. It's a great market to leisurely walk around, take photos, and sample the food. For clothes and souvenirs, the Chiang Mai Night Bazaar that sets up every night on Chang Klan Road is a sprawling shoppers paradise. Get a Massage – There are an abundance of places in Chiang Mai to relax and get a soothing Thai massage. 1 hour massage should cost 150 – 250 THB ($5 – $8.36). Doi Suthep Temple and Bhuping Palace – Just outside Chiang Mai, on the top of the nearby mountain is this famous temple and palace. Going there makes for a great day trip and provides incredible views over the entire valley of Chiang Mai. Trekking – There are many adventure tour companies that offer packages to trek around the hillside region near Chiang Mai, stay in a local home, and visit a hill tribe. Nature and Animals – If you enjoy wildlife and animals up close, Chiang Mai will supply you with some thrilling animal interactive activities. Elephant farms like Maesa Elephant Camp and Patara Elephant Farm, are set up to let you interact with elephants and marvel at their beauty. Head to Tiger Kingdom if you are interested in getting close and petting a giant tiger! 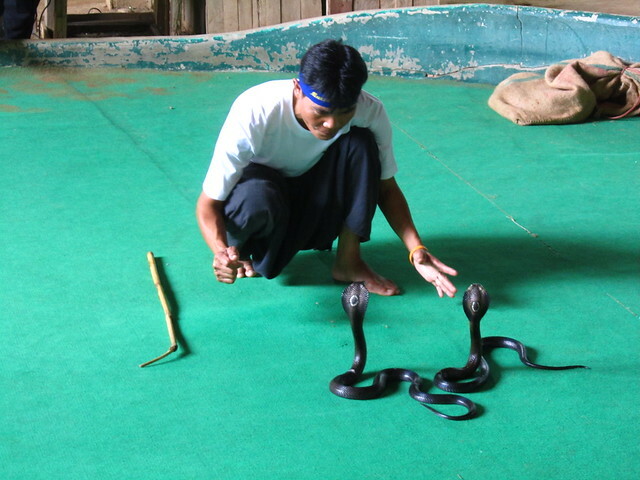 For those who like slithering snakes there are a number of snake shows where handlers demonstrate how to catch a cobra with bare hands. Just like the rest of the country, Thai food is delicious and supplied in abundance throughout Chiang Mai. Taking a walk around the Warorot main market is one of the best places to get started sampling the assortment of best Thai dishes. 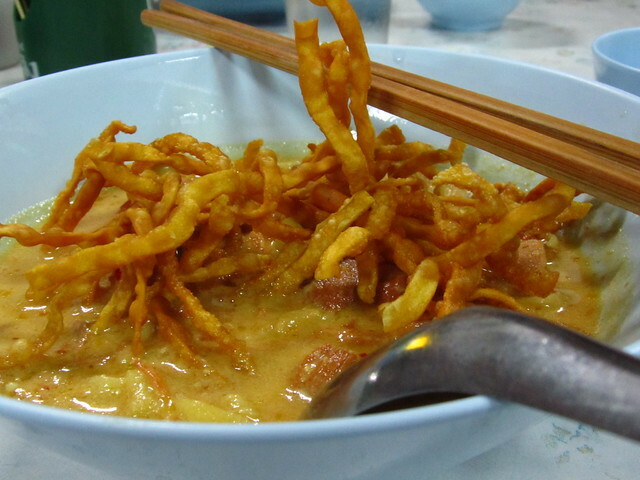 Some regional Chiang Mai foods to sample include sai ooah (spicy sausage), khao soi (curry noodle soup), gaeng hanglay (hanglay curry), and nam prik ong (chili sauce and vegetables). Aroon Rai – 45 Kotchasarn Road. A good cheap restaurant serving an extensive array of Thai food and regional specialties. Huan Huay Kaew – 31/2 M.2. T.Suthep, Huay Kaew Rd. A nicer sit-down restaurant near Doi Suthep temple that serves delicious Northern Thai food in a nature environment. The nightlife in Chiang Mai is not quite as diverse and crazy as Bangkok, but there are a ton of small bars, hang out chill spots, live music venues, night clubs, and go-go bars. Overall, Chiang Mai is a pleasant town to indulge in relaxed nightlife activities, meet other travelers, and enjoy a peaceful drink. The Red Lion – 123 Loi Kroh Rd., Night Bazaar, T. Changklan, A.Muang, Chiang Mai 50100, Thailand. A famous English style pub in the center of Chiang Mai. Discovery Night Club – Huay Kaew Road. One of the most happening night clubs in Chiang Mai, usually plays Thai style rock and pop. Popular almost every night of the week. Monkey Club – Monkey club. 7 Nimmarnhenin 9 Rd. Suthep. Muang. Chiang Mai 50200. Great lively night club in Chiang Mai. Roots Rock Reggae – A venue for reggae music and a crowd of happy foreigners and Thais.